In Spencer’s painting of the middle 1930’s, his landscape and figurative works can appear to be at completely the opposite ends of the spectrum of his art. Indeed, his figure paintings were considered to be of such challenging and difficult subject matter that they were rarely shown in public. However, rather than being opposites, the landscapes and figure paintings are actually the embodiment of two intertwined facets of Spencer’s life and both have the same kind of attentiveness to the detail of untransfigured, factual appearance. Although Spencer had vaguely known Patricia Preece for some time, it was only after he moved back to his home town of Cookham with his wife Hilda in 1931 that a relationship between the two began to develop. Perhaps accentuated by difficulties in his marriage, Stanley became infatuated with Patricia. Through the early years of the decade, Spencer wrestled with the situation, attempting to steer a path which would allow him to keep both women, a path which could never succeed. Hilda was initially tolerant of Spencer’s situation but remained firm, whilst Patricia became more and more demanding of his time and resources, and Spencer found himself in dire financial straits on a number of occasions. During this time, his dealer, Dudley Tooth, encouraged Spencer to produce landscape and still-life work which he found a ready market for through his London gallery. From 1932 onwards Spencer could usually be found with his easel set up in the open air somewhere around Cookham. 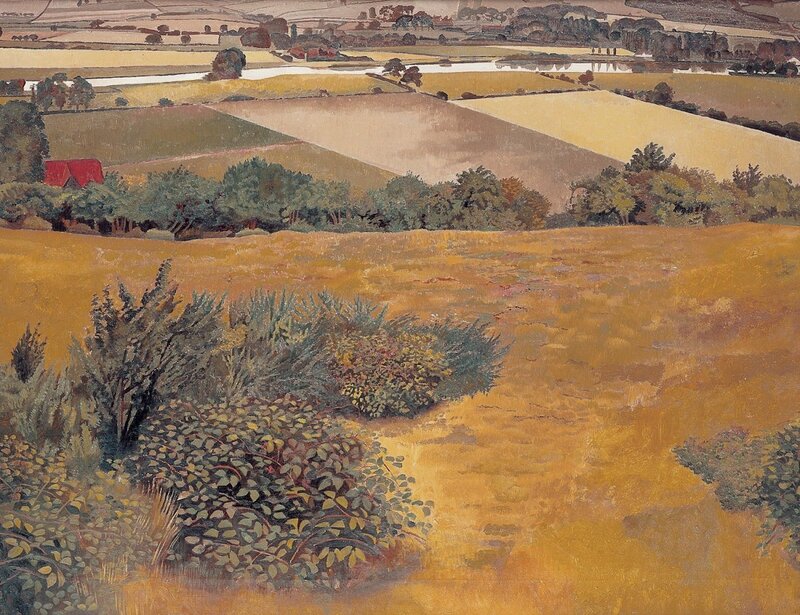 He found that his periods of landscape painting took him away from his domestic troubles and, as his friend Sir John Rothenstein noted, ‘give him hours of peaceful respite from the fearful effort involved in the production of large pictures, packed with incident and deeply felt; they refresh his vision by constantly renewing his intimate contacts with nature; and they charge his fabulous memory’. The paintings of Cookham serve to re-emphasize Spencer’s intimate involvement in the use of the town as his personal setting for the dramas of his visionary paintings. His best landscapes of this period render sacred all that is most ordinary. A View of the Thames from Cockmarsh Hill, Cookham, is just such a painting. Moreover it is an important precedent for Spencer’s favourite painting of this time Cookham from Cookham Dene, 1938 (Bradford Art Galleries and Museum), about which Spencer talked of ‘a special atmosphere in which I find a peace…In all my ceaseless effort to cater for my own needs this landscape …came nearest to obliging me’.